Welcome to the Mild Hyperbaric Training Program courses. This course is the first mild hyperbaric safety and training course of its kind. This course was written by Dr. Louis Hilliard and his team of health care professionals. The course is designed for the user in mind to learn the basic fundamentals of mild hyperbaric oxygen therapy: history, science, safety procedures, laws and regulations. This course will give you the tools necessary to operate your chamber efficiently and safely. What good is a tool if you don’t know how to use it correctly. People will go and spend tens of thousands of dollars on a hyperbaric chamber and have no idea how to use it properly or safely. Don’t become discouraged because of not getting the results you hoped for? Don’t put yourself, family or patients life at risk. Are you willing to put your health or a life on the line? Like most people, no way! So click the link below and learn how to use your hyperbaric chamber. HBOT Safety Training will cover the history, science, uses, safety procedures, laws and regulations. It is made up of reading, videos and illustrations to help you understand hyperbaric oxygen therapy concepts. At the end of each topic there are quizzes and a final exam to test the students comprehension and knowledge of HBOT. 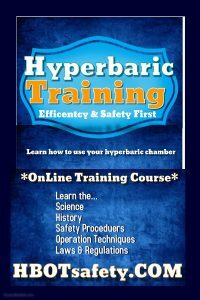 Click the link below and start your hyperbaric journey on the right foot and take the course. Protect your loved one’s and your investment. Start your hyperbaric training today. GOLD Standard in the industry. When you buy a hyperbaric chamber from Atlanta Hyperbaric Center you are not just getting a hyperbaric chamber you are getting gold standard top notch service and expertise that is second to none. All of our amazing customer receive. LEADERSHIP- FREE One on one time with Dr. Louis Hilliard. He has over 15 years’ clinical experience, 10 years running one of the most successful hyperbaric clinics in the country and has cared for thousands of patients around the world. Dr. Hilliard has cared for Dr. Phil Show patients, is the doctor to the stars and have been on TV promoting hyperbaric. You will receive customized care plans, online safety training, custom and videos. We have over a 100 positive reviews that shows that Dr. Louis Hilliard and Atlanta Hyperbaric Center stand behind our products with warranty and service. No questions asked. GUIDANCE- Dr. Louis Hilliard is very passionate about hyperbaric and has help thousands of people to get their own hyperbaric chamber. Don’t get confused by all the models and sales gimmicks form sales people that have never even used a hyperbaric chamber. Call us and we can help you make to right decision for your hyperbaric needs. NO MONEY, NO WORRIES – You don’t have all the money? Don’t worry! We work with multiple financing companies that will help you get the hyperbaric chamber you want at the monthly payment that is affordable. We offer discounts to Veterans, active duty military, first responders and NFL players. Let Us Help You Sell Your Chamber- We help people every day get amazing results. When you have achieved the desired results using your hyperbaric chamber and you are through with it. Let us help you sell your hyperbaric chamber through our consignment program- Sell Your Chamber.